The most beloved Autobot from Transformers is Bumblebee, so it is no wonder that there are numerous manifistations of this figure in the world of toys. 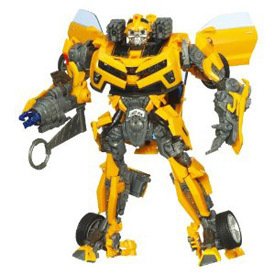 If one were limited to picking only one action figure from the host of action figures that have come out from the recent films (and indeed the long-running television program before the current movies), Bumblebee would have to be the one. He has the most name recognition; he has the charming personality; he is the protector; he goes through the most risk and the most suffering in the recent films.